NEW YORK—Facing financial shortfalls due to an abbreviated season and eager to compete with traditional prime-time entertainment, the National Basketball Association announced Friday it would soon debut NBA Nights, an hour-long suspense series in which the league's top stars investigate and battle supernatural threats to humanity. "This spring, your favorite stars leave the amazing on-court action of professional basketball behind and take their teamwork to an even darker, more dangerous arena—that of mankind's never-ending struggle with the forces of darkness," NBA commissioner David Stern said in a press conference. "These are world-class athletes—but can they survive confrontations with vampires, werewolves, vengeful ghosts, and their own inner demons? Tune in to NBA Nights this spring on NBA TV to find out." Although the paranormal-intrigue show will not debut until mid-March, the NBA will begin promoting the series during games later this month, beginning with the Timberwolves-Lakers meeting on Jan. 29. According to show insiders, Kobe Bryant will become suspicious that certain Minnesota players may be a different sort of wolf altogether when Darko Milicic checks in to the game unshaven, haggard, and playing with an unusual ferocity. After the final buzzer, when the Lakers discover deep gouges on the basketball—apparently sinister claw marks that "weren't made by the dribbling of anything human"—it's up to a trench-coated Kobe to chase down Milicic as a full moon casts ominous shadows across L.A.
"Will Darko be friend or foe?" a press release for the half-hour postgame teaser read in part. "Can the commanding but shadowy figure known only as 'the Commish' turn a league of unruly on-court rivals into an elite midnight squad of monster hunters? Who can be trusted, and who is hiding what? Alliances will be forged and shattered, team loyalty will be tested, and everything NBA players think they know about one another will change as they step across the threshold into a darker, more mysterious world." NBA Nights will reportedly feature a broad, constantly revolving cast of characters, with weekly episodes showcasing every franchise in the league: Emeka Okafor pursues zombies in New Orleans, Andrew Bogut and Mike Dunleavy battle thawed-out vikings in Milwaukee, and Kobe and his Lakers teammates realize the entire Los Angeles crowd is a swarm of soul-eating demons. However, the NBA is promising a larger, deeper story will unfold as the season goes on. 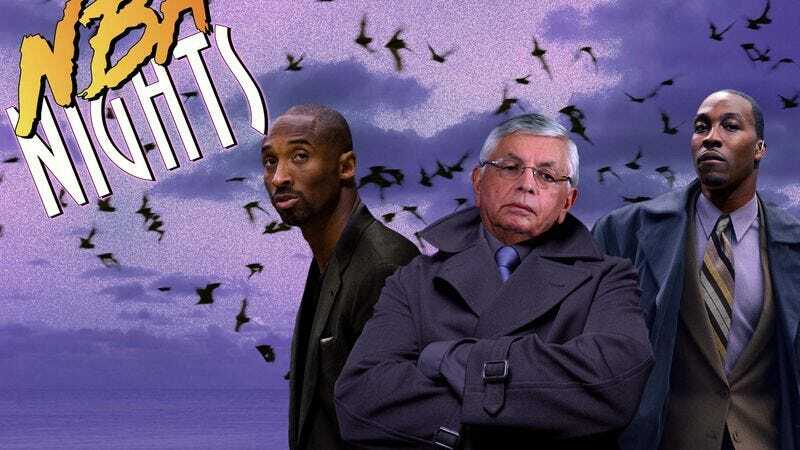 "There are hints early on that being a supernatural investigator won't be easy or simple for these guys just because they're NBA players," Stern said. "Sure, it's true they can spot things most people can't, such as a deposit of ectoplasm on an unusually high ledge, and they have skills that give them advantages against certain denizens of the underworld, such as Chinese hopping vampires. But at the end of the day, the point of the series is that they're only human." "Most of them, anyway," Stern added. "For instance, you'll notice Blake Griffin and the baffling illusionist known as 'the Harlequin' never appear on screen at the same time." While the league is keeping many specific details of NBA Nights secret, it has invited critics to view early episodes of the show, and their responses have been almost unanimously positive. "Production values ands special effects are generally very high, and the plot involving a race of deathless aristocratic Satan-worshippers buying Madison Square Garden seems promising," critic Meredith Woerner wrote in the science-fiction blog io9. "The three episodes I saw were a little heavy on leaping into the air to grab skulls, or on basketball-playing occult sleuths throwing crystal orbs to one another behind their backs, but every show goes through teething problems." "Once the writers get more comfortable with storytelling and learn not to rely so much on defeating the monster in the last two minutes every time, this show could be a legitimate hit."